2018 turned out to be a year of interesting firsts for Nollywood. It was the first time Ebonylife Films released two films in one calendar year. The first time a non-comedic film made as much as ₦200million (looking forward to more of this). The year Netflix acquired its first Nigerian Original film. Probably the first time up to ten Nollywood films screened in one single month; and definitely the first time one director made two films that crossed the ₦200million mark in the same year. Interesting, right? Well, firsts can be good, in the sense that these events have the potential to reoccur. But we know that not all firsts are good, especially where the goal solely becomes the replication of the results rather than the honing of the creative process. I’m not really here to talk about firsts though. Rather, I aim to provide a genuine ranking of what I consider my favorite outputs from Nollywood in the course of 2018. As with all my lists, I provide the disclaimer that I didn’t watch every film released, so I may miss out on some gems. I also did not feel obligated to complete a top ten in all categories, where I did not have up to ten favorites. Finally, I enjoy certain things more than others cos man’s got his tastes; so this is my list of favorites, feel free to disagree. With the disclaimer out of the way, please find below, my list of Favorite Actors, Actresses and Films from Nollywood in 2018. Nollywood gave us some sweet villains in 2018 and my list will feature a few of them. First up though, is Ademola Adedoyin as Gowon in the crime thriller Knock Out Blessing. Even though Ademola had a good year on screen, (he starred in both KOBs, and played God in God Calling), my favorite of his Characters was the no-nonsense, kill an entire army squad, assassin. Rumor has it that we are yet to see the last of Gowon on screen… let’s see how that goes. If you look up the word Veteran, there are quite a number of Nollywood actors (male and female), that should show up in the Nigerian examples. One of them is definitely Pete Edochie, and it was a pleasure to see him return to the screen in 2018 as Ernest Obiagu in Genevieve Nanaji’s Lionheart. Someone made a joke that he managed to have a heart attack in Lionheart as well; heart attack or not, we would look really hard to find actors that can pull off the presence that Edochie exudes on screen. This is the first time I’m seeing Ibrahim Suleiman on the big screen. He’s been in other things but I don’t think I’ve seen him in a feature length film before now. That being said, Ibrahim was the life of Up North to me. He had good comedic timing, felt quite natural to observe and had better chemistry with his co-lead than the intended romance at the core of the film. Maybe because the two of them come across as good friends in reality, but out of all the performances in Up North, his did it for me. There’s something about Kanayo O Kanayo and his swag when portraying Villainy on screen. It may be a persona built up over the years, but whatever it is, his role as Igwe Paschal is rich in it. Igwe Paschal is treacherous, and does not try to hide it in any form. He’s also quite a ballsy businessman which makes him a formidable foe to Genevieve Nnaji’s Ada. Another Veteran actor who had a good year on the big screen is Nkem Owoh. From Chief Daddy to God Calling and Lionheart, Nkem Owoh spread his tentacles into some of the biggest films of 2018. My two favorite from him were God Calling and Lionheart, but more God Calling where his pairing with Onyeka Onwenu seemed to elevate his character a bit above the rest. For her coming of age feature film Kasala!, Director Ema Edosio tells the tale of a day in the lives of four young men, who through youthful exuberance landed themselves in what some people would refer to as deep sh*t.
To execute the story, Ema enlisted four young actors who not only deliver, but provide one of the best ensemble chemistry I have seen amongst actors on the big screen. These four young men take you through their journey to fit in, and be ‘cool’ teenagers in ghetto Nigeria. But more importantly, they provide some much needed organic comedy on the big screen. I believe Dare Olaitan does a good job of creating memorable characters in his movies. Last year’s Ojukokoro had a few with Shawn Faqua shining brightest. This time, the spotlight is on Bucci Franklin as crime boss Dagogo. If you haven’t watched ‘Knock Out Blessing’ yet, you should and make sure to look out for Dagogo, he’s a thrill. I don’t think I need to say too much about Reminisce. If you haven’t heard, Reminisce was the break out star of Kemi Adetiba’s King of Boys. Makanaki was the villain of the year! Bold, ambitious, cunny and ruthless. It’s notable to mention that Reminisce gave us one of Nollywood’s most memorable villains in recent times, in his first acting gig. I wonder if he has plans to do more acting in future. In my opinion, there are two main ways an actor can seal his place in the minds of audiences. a. Appear in enough work that they see you frequently enough to remember you. b. Appear in that one role that blows their socks off. Jammal Ibrahim has chosen the second path with his role in Adekunle ‘Nodash’ Adejuyigbe’s The Delivery boy. As Amir, a young boy who is sold into terrorism and abuse, Jammal embodies a character who transports the viewers on a journey of hurt, betrayal, and revenge. He doesn’t have all the answers or a well thought out plan, but he is the perfect anti-hero to take up the No.1 spot on my list. There’s not many performances in Up North that I was endeared to. From unbelievable romances and convictions, to silent beauties and distracting pronunciations, Up North is held together more by the beauty of the landscape and cinematography. Which is probably why the performances by Ibrahim and Michelle stood out prominently. Playing the gracious and level headed sister to Banky W’s immature Bassey, Michelle Dede keeps showing us that she is deserving of every success she has as an actor. I’m definitely a fan, and I hope to see her in even more movies in 2019. I once said that Wofai Fada probably has some of the best comedic timing and banter I’ve seen in Nigerian films, I maintain it, making it easy for her to claim a spot on my list for her role in Tope Oshin’s New Money. Genevieve Nnnaji is a star. A superstar. And she proves herself again with Lionheart. For her role as Ada, the heir apparent to a sinking ship, she must use all her wits to save her family’s legacy. This is fitting for Genevieve allowing her showcase her grace and stiff expressions, with ease and class. She definitely played to her strengths and that worked well with the tone of the film. Child actors are few and far between in Nigeria and many times are not memorable enough to be remembered after the credits roll. This is not the case for Diana Egwatu who leaves a strong impact to be felt long after her short stint in God Calling. Where most child actors feel like ornaments in a film, one cannot help but notice Diana Egwatu, who hold’s her own among the solid cast around her. Onyeka Onwenu is another Veteran who appeared in multiple films this past year. While I loved her in God Calling, it was her role as Genevieve Nanaji’s mother in Lionheart that catapulted her to this list. Stern and wise, I dare say that she displayed a more seasoned grace than her daughter managed. Sola Sobowale is a force. That cannot be denied. The magnitude of her force definitely came across in her portrayal of Alhaja Eniola Salami in Kemi Adetiba’s King of Boys. The introduction of the character Eniola and the scene with the hammer may well be my favorite from the movie, as her portrayal graduates from there to, ‘over the top’ and ‘excessively weepy’. She’s really captivating to observe on screen, however for someone referred to as ‘The King of Boys’, she never really convinced me of her rise to that title. Which is why she doesn’t take the top spot on this list. Just before the end of 2018, we were treated to Dagogo’s Angels. A remarkable trio of ladies played by Ade Laoye, Meg Otanwa and Linda Ejiofor. These three ladies, who find their paths intertwined by fate, spend the majority of the runtime of Knock Out Blessing on a journey to achieve the lifelong dream of Pivotal character Blessing – or should I say One Punch Woman. And boy do they do a darn good job playing the Damsels-Not-In-Distress, especially Ms Laoye. While Older Eniola was a tad bit unconvincing as the boss that she should have been, young Eniola was playing no games in showcasing her ruthlessness. In fact, you can almost feel the disgust she is feeling in the dream scene where she confronts Older Eniola; I mean, why so hopeless? Toni Tones has shared how she had to put on weight and shadow Sola Sobowale to learn her mannerisms and portray the character better and its evident that the hard work paid out. Here’s hoping we get to see her in more career defining roles on the big screen. 2018 was a good year for Zainab Balogun. Not only did she debut her first lead role in Royal Hibiscus Hotel, she followed it with two more lead roles in Sylvia and God Calling. I don’t know if any other actor can boast of three lead roles in 2018, but I may be wrong. While Royal Hibiscus Hotel showed that Zainab could carry a lead role, Sylvia demonstrated that she had intentions to continue bagging lead roles, and God Calling was an emotional and impactful end to her year. It’s no surprise that she bagged the future award for acting and the top spot on my list, as she’s one I’m definitely eager to see in more films among her contemporaries. The first release by Tope Oshin in 2018, New Money is a rags to riches, Mainland to Island tale that does an adequate job of not sucking. Somewhat a Princess Diary situation, the difference between our leads is what they get to inherit. While our Oyinbo sister inherits a throne, her Nigerian counterpart inherits a business empire and if you’ve seen enough of these type of films, you kinda know how it plays out. This famous million dollar Nigerian film may not have been released theatrically in Nigeria, however it enjoyed a limited release in the USA and was the closing film at the 2018 Africa International Film Festival. The movie tackles one of Nigeria’s most infamous exports and the biggest bane to the country’s public image – Scamming; and while it does a good job with the story telling, it has a major flaw in the casting of its lead, which may not play well with the local market. The second film by Director Tope Oshin on my list, (she had a good year o), Up North is the debut film from Anakle Films. Produced by Editi Effiong, Zulumoke Oyibo and Isioma Osaje, the movie narrates the tale of a rebellious young heir, showcasing Nigeria’s mandatory National Youth Service Corps and the culture of Northern Nigeria. It’s a beautiful film to watch, although I found it hard to connect with some of the characters. As a whole though, Up North was a good family friendly film for the holiday period. I remember watching the trailer for God Calling and vowing to ensure I saw the finished product. That was how moved I was by what I consider the best cut Nigerian trailer of 2018. But did that totally translate to a great film… well maybe not great but good enough to grab the No. 7 spot on my list. Where God calling lacks a bit in the story, it makes up for with performances and visual effects. It’s a film that would resonate well with people of Faith, though I’ve heard some people call it preachy. Going through my list, I realize that there are quite a number of sophomore directorial features. God Calling, King of Boys, and Knock Out Blessing. For Knock Out Blessing, Director Dare Olaitan maintains some of what we’ve come to know and like of his film making style. An intense story, gritty performances and a cinematic style that is more understated than flashy. While the movie is a good follow up to 2017’s Ojukokoro, it concludes on a dissatisfying note, stifling its position on this list. The breakout success and most likely what audience members will call The Nollywood film of 2018, Kemi Adetiba’s King of Boys was undoubtedly a hit. Achieving both commercial and somewhat critical acclaim, the sophomore film (and first personal project) from the filmmaker was a foray into a relatively untapped genre in cinematic Nollywood (Crime Thrillers). Running for a whooping 2hrs 50mins, King of Boys manages to not only hold the audiences’ attention, it thrills, giving us Nollywood’s most formidable villain of 2018 and really good acting performances. Unfortunately, as I said earlier, the movie failed to convince me as to Eniola Salami’s stake to the title, ‘King of Boys’, which may be either be a result of poor scripting or a fallout of the multiple edits to meet an under 3hr screen time. Probably the most popular film on the list, Lionheart made waves when it was announced as the first Nigerian Netflix Original Film. Produced, Directed and Starring Genevieve Nnaji, Lionheart is a beautiful film that doesn’t try too hard to impress. It is a simple tale served on a platter of premium performances, riveting set design and cinematography. While there’s some holes to be poked in the premise of the story, there’s a grace with which it is told that keeps one smiling from ear to ear as the movie unfolds. Trino Studio’s debut feature film is a foray into the supernatural; what is termed, ‘the spirit wife’ in some circles. Featuring Zainab Balogun, Chris Attoh, Ini-Dima Okojie amongst others, the beauty of Sylvia stems its cast and the ease at which they appear to bring the story to life. There’s beautiful chemistry, a breathtaking tone to the set design and rage, utter rage. Ever heard of the wrath of a woman scorned? Think on that, then elevate it to the wrath of a spirit woman scorned! This is essentially what Zainab Balogun had to pull off as Sylvia. Hopefully, the film becomes available on a VOD platform soon, as I believe more people need to enjoy it. There is a raw energy one experiences when watching Kasala. No pretense at all, just film making on a level that is so surreal and focused on the story at hand. And what an interesting story it is. For her feature film debut, Director Ema Edosio, takes the audience on a journey in a day of the lives of four Nigerian teenagers from, ‘the hood’. A coming of age tale, Kasala does a splendid job of capturing youthful exuberance and foolishness, and how every problem at that age seems like the end of the world. 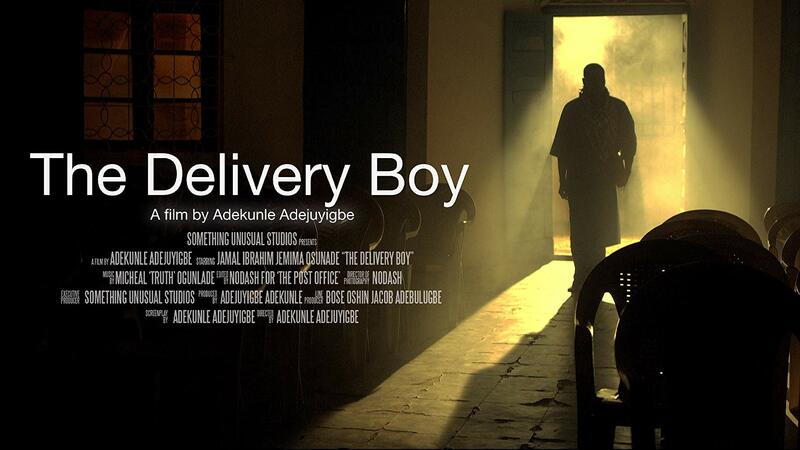 Adekunle ‘Nodash’ Adejuyigbe’s The Delivery Boy is yet to screen commercially in Nigerian Cinemas. Typically, I wouldn’t add a film that hasn’t screened commercially on my list. However, I’m not very certain if it would, and it would be a great injustice not to give it a deserved place, in the event that it doesn’t screen in cinemas this year. Narrating the story of a young orphan sold into terrorism, his experience with sexual assault, a distorted love and an intemperate need for revenge, Delivery Boy is an excellent balance of conscious film making using the right technical tools. It’s captivating enough to keep the audience at the tip of their seat; the cinematography and lighting keep the mood just right, and its lead actor is so riveting in his depiction of the character Amir that one can’t help but be totally engrossed during the just over 1hr runtime of the film. Definitely my favorite film of 2018, I truly hope that the business side of things are sorted to make The Delivery Boy more accessible to the mass audience in 2019. It’s definitely one film I would like to experience again in a conventional cinema setting with a mass audience. So there you have it. My favorites from 2018. Is there anyone you think I missed out, or any you think doesn’t deserve a spot on the list? Let me know in the comments section.